The illegal annexation of Crimea by the Russian Federation in April 2014, which was followed by the armed conflict in Donbas that has been financed, supported (through military, economic and political assistance) and de facto controlled by the Russian Federation, resulted in the large-scale expropriation, destruction, impairment and losses of investments in the occupied territories of Crimea and Donbas. This includes investments owned by both private and state-owned companies. According to the State Property Fund of Ukraine, over 900 state-owned companies, including Ukrainian Railways, Ukrainian Seaport Authority and Ukrainian Post, lost their investments in Crimea and Donbas. According to the report of the Atlantic Council (in the article ‘Kremlin Aggression in Ukraine: The Price Tag’) the material losses of Ukraine in Crimea and Donbas may amount to almost US$100 billion. Oschadbank v Russia, Lugzor LLC and Others v Russia and PJSC DTEK Krymenergo v Russia. At the same time, no investor–state claims against Russia have so far been pursued in respect of occupied Donbas. Russia’s involvement and its effective control over Donbas is supported by abundant evidence, and, similarly to Crimean cases, the Russian Federation shall be responsible under international investment law for expropriation, destruction and other damages to investments in Donbas. In this article, I will explore, among other matters, the grounds to hold the Russian Federation responsible under its own bilateral investment treaties (BITs), including the Russia–Ukraine BIT, for expropriation, destruction and failure to protect foreign investments during the armed conflict in the occupied territories of Donbas. Russia’s responsibility may be triggered by the effective control directly or indirectly exercised by Russia in Donbas. The abundant evidence collected by the Ukrainian authorities and international organisations supports the view that the Russian Federation has been in effective control over Donbas since 2014 and, therefore, shall be treated as an occupying power. 175. It is not disputed between the Parties that General Kazini, commander of the Ugandan forces in the DRC, created the new “province of Kibali-Ituri” in June 1999 and appointed Ms Adèle Lotsove as its Governor. Various sources of evidence attest to this fact, in particular a letter from General Kazini dated 18 June 1999, in which he appoints Ms Adèle Lotsove as “provisional Governor” and gives suggestions with regard to questions of administration of the new province. This is also supported by material from the Porter Commission. The Court further notes that the Sixth report of the Secretary-General on MONUC (S/2001/128 of 12 February 2001) states that, according to MONUC military observers, the UPDF was in effective control in Bunia (capital of Ituri district). A classical case of occupation involves the physical presence of a hostile army of one state exercising authority (effective control) over the territory of another state without consent. However, in today’s armed conflicts, such as that in Donbas, it is usual for a foreign state to exercise its control over a given territory through the local military or paramilitary groups, which are trained, equipped, financed, generally supported and coordinated by the state. International tribunals and courts developed ‘overall control’ concept to attribute actions of local military groups to outside (foreign) state, which finances, supports and coordinates such groups. In relation to areas within Bosnia, Croatia played the role of occupying Power through the overall control it exercised over the HVO [the local militia, which destroyed the property of the Bosnian Muslims], the support it lent it and the close ties it maintained with it . . . . the overall control exercised by Croatia over the HVO means that at the time of its destruction, the property of the Bosnian Muslims was under the control of Croatia and was in occupied territory. 131. In order to attribute the acts of a military or paramilitary group to a State, it must be proved that the State wields overall control over the group, not only by equipping and financing the group, but also by coordinating or helping in the general planning of its military activity. Only then can the State be held internationally accountable for any misconduct of the group. However, it is not necessary that, in addition, the State should also issue, either to the head or to members of the group, instructions for the commission of specific acts contrary to international law. In the Bosnia Genocide case, the ICJ rejected the ‘overall control’ test, as applied by the ICTY in the Tadic case, stating that this test provides for a wider scope of state responsibility for acts committed by others as reflected in article 8 of the ARSIWA. In Bosnia Genocide, the ICJ followed its earlier Nicaragua case and applied the ‘effective control’ test, which requires a greater degree of control by a state over military or paramilitary groups operating outside its borders in order to attribute their wrongful acts to the controlling state and trigger its responsibility. The requirement of international law for the attribution to States of acts performed by private individuals is that the State exercises control over the individual. The degree of control may, however, vary according to the factual circumstances of each case. The Appeal Chamber fails to see why in each and every circumstance international law should require a high threshold for the test of control. The European Court of Human Rights (ECtHR) in its jurisprudence uses a similar and wider effective control tests to decide which state shall be responsible for violation of human rights on a given territory – the sovereign state deprived of effective control over its territory or the aggressor state which gained and exercises authority over such territory. Although the ECtHR does not employ territorial nexus, its jurisprudence sheds light on responsibility of states for activities of non-state actors outside their territories. Having effective overall control over northern Cyprus, its [Turkey’s] responsibility cannot be confined to the acts of its own soldiers or officials in northern Cyprus but must be engaged by virtue of the acts of the local administration which survives by virtue of Turkish military and other support. All of the above proves that the “MRT”, set up in 1991–1992 with the support of the Russian Federation, vested with organs of power and its own administration, remains under the effective authority, or at the very least under the decisive influence, of the Russian Federation, and in any event that it survives by virtue of the military, economic, financial and political support given to it by the Russian Federation. Ukraine and its parliament regard the uncontrolled territories of Donbas as ‘temporarily occupied’ by the Russian Federation, as occupied by the ‘military forces of the Russian Federation’ and as under the ‘occupation administration of the Russian Federation’. Ukraine asserts that it is in possession of plentiful evidence to prove that self-proclaimed bodies that usurped the exercise of power on the occupied territories of Donbas are controlled by Russia, that irregular illegal armed groups in Donbas have been created, subordinated, managed and funded by the Russian Federation. The Russian rouble was introduced as the single currency in the territory of certain districts of the Donetsk and Luhansk Regions. The DPR and the LPR emerged as two of the primary illegal armed groups operating in Ukraine. These organizations and other groups and individuals associated with them are proxies of the Russian Federation: they operate with critical Russian support and assistance, defying Ukrainian and international law, committing acts of terrorism, and inflicting violence and human rights abuses on the people of Ukraine [in DPR and LPR]. During the course of the conflict, periods of particularly intense battles were reported in Ilovaisk (Donetsk oblast) in August 2014 and in Debaltseve (Donetsk) from January to February 2015. The increased intensity of fighting during these periods has been attributed to alleged corresponding influxes of troops, vehicles and weaponry from the Russian Federation to reinforce the positions of the armed groups. In the appeal to the international community, the Ukrainian parliament asserted the ‘active support of terrorists at the state level’ by Russia. Ukraine filled two applications to the ECtHR – on the situation in Eastern Ukraine and Donbas before and after September 2014. Ukraine places responsibility on the Russian Federation for numerous violations of the European Convention on Human Rights as a result of ‘de facto control over the regions of Donetsk and Luhansk’ by the Russian Federation. The Organization for Security and Co-operation in Europe monitoring mission reported the presence of troops naming themselves as Russian servicemen in the DPR-controlled territory. The Atlantic Council reported that by July 2017, 36,300 Russian proxies and 2,900 Russian regular military personnel (from Kostroma, Novorossiysk and Volgograd Regions of Russian) were present in occupied Donbas. Russia supplied weapons and military equipment to the DPR and LPR, including Russian tanks, heavy artillery and multiple launch rocket systems, armored fighting vehicles and anti-aircraft warfare systems. Such combination of direct and indirect evidence demonstrates that, from the very start of the armed conflict in Donbas (eastern Ukraine) the Russian Federation has been exercising effective control over and is an occupying power in Donbas. Even though it may be more difficult for investors to prove classic occupation of Donbas by Russia, there is abundant convincing evidence of indirect occupation of Donbas by Russia through the overall control over the local anti-government forces, including financial support, supply of weapons and military equipment, political support and coordination of military operations in the occupied territories. BIT’s territorial application: what is territory? Assuming that Russia exercises effective control over Donbas directly (through its military personnel present in Donbas) or at least indirectly through the overall control exerted by Russia over the anti-government forces of the unrecognised DPR and LPR, I will now consider whether the territorial application of Russian BITs, including the Russia–Ukraine BIT, and whether the obligations of the Russian Federation to protect foreign investments in its territory shall be extended to occupied Donbas. It will be instructive to review the Crimean cases in which arbitral tribunals have extended the territorial application of the Russia–Ukraine BIT to annexed Crimea. For example, in PJSC Ukrnafta v Russia and Stabil LLC and Others v Russia, two identically constituted tribunals in jurisdictional rulings dated 26 June 2017, held that the Russia–Ukraine BIT applied to annexed Crimea and the Russian Federation was responsible for protection of the investments of the Ukrainian investors in Crimea after its annexation by Russia. Relying on Russia’s own assertions that annexed Crimea was an integral part of Russia’s territory and also relying on Ukraine’s written submissions acknowledging that Crimea was under occupation and under effective control of the Russian Federation, the tribunals were satisfied that the Russian Federation established the effective control over Crimea through a combination of physical occupation of Crimea in February 2014 and legal incorporation of Crimea into the Russian Federation in March 2014. The arbitral tribunals did not consider the legality of Russia’s occupation of Crimea. In light of the object and purpose of the Russia–Ukraine BIT – to encourage and to protect foreign investments – the arbitral tribunals interpreted the term ‘territory’ in the Russia–Ukraine BIT broadly to cover the ‘entire’ territory over which the Russian Federation exercises its effective control (and its de facto jurisdiction), irrespective of whether such territory is lawfully or unlawfully occupied by the Russian Federation. The Russian Federation was able to exercise its de facto jurisdiction in Crimea and this alone was sufficient for Russia to be held responsible for protection of investments in Crimea under the Russia–Ukraine BIT. to leave without protection foreign investments on a territory over which a State exercises exclusive control [effective control] . . . particularly in circumstances where that State is not only the main beneficiary-State of these investments but also the only state in a position to protect foreign investments. Because the Russian Federation exercises ‘effective control’ over Donbas, either directly or indirectly through overall control over the local anti-governmental authorities in DPR and LPR, the same reasoning may be invoked by foreign investors, including Ukrainian investors, to extend the application of Russia’s BITs, including the Russia–Ukraine BIT, to occupied Donbas and to hold Russia responsible for expropriation and impairment of foreign investments in Donbas. Apart from broad application of the territorial scope of Russia’s BITs to occupied Donbas based on broad interpretation of the term ‘territory’, investors may also consider an argument that the territorial application of Russia’s BITs shall be extended to the newly acquired territories based on the moving treaty-frontiers rule. (b) treaties of the successor State [treaties of Russia] are in force in respect of the territory to which the succession of States relates [in respect of occupied Donbas] from the date of the succession of States, unless it appears from the treaty or is otherwise established that the application of the treaty to that territory would be incompatible with the object and purpose of the treaty or would radically change the conditions for its operation. applies only to the effects of a succession of States occurring in conformity with international law and, in particular . . . the Charter of the United Nations [the UN Charter prohibits an illegal use of force, including illegal occupation by states of foreign territories]. Richard Happ and Sebastian Wuschka in their recent article ‘Horrow Vacui: Or Why Investment Treaties Should Apply to Illegally Annexed Territories’ have discussed that the non-recognition principle and the moving treaty-frontier rule should be applied in a way to deny benefits to Russia for the illegal annexation of Crimea. However, they should not excuse Russia from its obligations to protect foreign investments in annexed Crimea under Russia’s BITs. We agree with the approach and reasoning advanced by Mr Happ and Mr Wuschka. We believe that the same approach is equally applicable to occupied Donbas. Under the non-recognition principle, the main reason for denying the recognition of title to illegally acquired territories, and to exclude state succession in respect of treaties in such cases, was to deprive states engaged in unlawful conduct violating territorial sovereignty of other states from any benefits and rights arising from their unlawful actions. However, it would be contrary to the very purpose of the non-recognition principle if this principle were applied the other way around to permit an occupying state to avoid international obligations and responsibility under its own treaties, including its international obligations to protect foreign investments pursuant to its BITs, in respect of any illegally occupied territories. Therefore, the effect of Russia’s BITs in occupied Donbas shall not be recognised in respect of any benefits and rights, which Russia may potentially claim in such case. For example, Russia shall not be permitted to claim that under its applicable BITs Russia is entitled to nationalise or expropriate foreign investments in occupied Donbas if such nationalisation or expropriation are made for public purpose and subject to prompt, adequate and effective compensation. However, it shall not release Russia from its obligations to protect foreign investments in occupied Donbas under Russia’s BITs because Russia is the only state exercising effective control in Donbas and the only state, which has capacity to protect investments in Donbas. 118. South Africa, being responsible for having created and maintained a situation which the Court has found to have been validly declared illegal, has the obligation to put an end to it. It is therefore under obligation to withdraw its administration from the Territory of Namibia. By maintaining the present illegal situation, and occupying the Territory without title, South Africa incurs international responsibilities arising from a continuing violation of an international obligation. It [South Africa] also remains accountable for any violations of its international obligations [in occupied Territory of Namibia], or of the rights of the people of Namibia. The fact that South Africa no longer has any title to administer the Territory does not release it from its obligations and responsibilities under international law towards other States in respect of the exercise of its powers in relation to this Territory. Physical control of a territory, and not sovereignty or legitimacy of title, is the basis of State liability for acts affecting other States. Everest Estate LLC was joined by 18 other legal entities. In Everest Estate LLC and Others v Russia, taking into consideration ‘apparent lack of relationships’ between the 19 claimants, the arbitral tribunal considered possible jurisdictional objections of the Russian Federation against multiparty claims from allegedly unrelated claimants. The arbitral tribunal noted that the UNCITRAL Arbitration Rules did not expressly provided for collective claims. The arbitral tribunal stated that the Russia–Ukraine BIT used both ‘investor’ and ‘investors’ wording. The tribunal also relied on the Abaclat and Ambiente Ufficio cases to conclude that although the Russia–Ukraine BIT did not expressly provide for multiparty claims, it does not mean there was a lack of consent by Russia and the investors. The arbitral tribunal stated that ‘the state [the Russian Federation] and each investor [each of the 19 investors in the case in question] have given their consent’. Finally, the arbitral tribunal found ‘sufficient link’ among the claimants due to the jointly submitted claim, the application of the same legal provisions, the existence of ‘similar circumstances’ related to expropriation of their assets in Crimea and ‘substantially identical’ relief sought by each claimant. Russia’s heavy involvement and its control over local anti-governmental groups in Eastern Ukraine are supported by abundant evidence, including the reported influx of Russian troops at some critical points in the armed conflict, continuous presence of Russian military personnel in Donbas, financial support, supply of weapons, political support and general coordination of military operation in Donbas by Russia. This convincingly demonstrate that the Russian Federation exercises effective control in occupied Donbas and shall be regarded as an occupying power. Therefore, similarly to the Crimean cases, foreign and Ukrainian investors acting individually or collectively may consider invoking Russia’s BITs to pursue investment claims against Russia and hold the Russia Federation responsible for expropriation of their investments in occupied Donbas. The author wishes to thank Professor Anthony Cassimatis for providing his valuable comments to this article. The author also wishes to thank his colleague Mariia Stolbova for research assistance and her helpful comments to this article. Anders Åslund, ‘Kremlin Aggression in Ukraine: The Price Tag’, Atlantic Council, 19 March 2018, www.atlanticcouncil.org/images/publications/Kremlin_Aggression_web_040218_revised.pdf. Luke Eric Peterson, ‘Russia held liable in confidential award for expropriation of hotels, apartments and other Crimean real estate; arbitrators award approximately $150 million (plus legal costs) for breach pf Ukraine bilateral investment treaty,’ 9 May 2018, IAReporter, www.iareporter.com/articles/russia-held-liable-in-confidential-award-for-expropriation-of-hotels-apartments-and-other-crimean-real-estate-arbitrators-award-approximately-150-million-plus-legal-costs-for-breach-of-ukraine-bi/. Luke Eric Peterson, ‘In jurisdiction ruling, arbitrators rule that Russia is obliged under BIT to protect Ukrainian investors in Crimea following annexation,’ 9 March 2018, IAReporter, www.iareporter.com/articles/in-jurisdiction-ruling-arbitrators-rule-that-russia-is-obliged-under-bit-to-protect-ukrainian-investors-in-crimea-following-annexation/. Jarrod Hepburn, Ridhi Kabra, ‘INVESTIGATION: Further Russia investment treaty decision uncovered, offering broader window into arbitrators’ approaches to Crimea controversy,’ 17 November 2017, IAReporter, www.iareporter.com/articles/investigation-further-russia-investment-treaty-decisions-uncovered-offering-broader-window-into-arbitrators-approaches-to-crimea-controversy/. Convention (IV) respecting the Laws and Customs of War on Land and its annex: Regulations concerning the Laws and Customs of War on Land, done on 18 October 1907, https://ihl-databases.icrc.org/ihl/WebART/195-200052?OpenDocument, article 42. Armed Activities on the Territory of the Congo (Democratic Republic of the Congo v Uganda), ICJ, Judgment dated 19 December 2005, paragraph 177. Prosecutor v Dusko Tadic, Case No. IT-94-1-A, ICTY, Appeal Judgement dated 15 July 1999, paragraphs 120 and paragraph 162. Prosecutor v Blaškic´, Case No. IT 95-14-T, ICTY, Trial Judgment dated 3 March 2000, paragraph 149. Prosecutor v Dusko Tadic, Case No, IT-94-1-A, ICTY, Appeal Judgement dated 15 July 1999, paragraph 131. Application of the Convention on the Prevention and Punishment of the Crime of Genocide (Bosnia and Herzegovina v Serbia and Montenegro), ICJ, Judgment dated 26 February 2007, paragraphs 402–404. Prosecutor v Dusko Tadic, Case No, IT-94-1-A, ICTY, Appeal Judgement dated 15 July 1999, paragraph 117. Loizidou v Turkey, Application No 15318/89, ECtHR, Judgment dated 18 December 1996, paragraph 56. Cyprus v Turkey, Application No 25781/94, ECtHR, Judgment dated 10 May 2001, paragraph 77. Ilascu and Others v Moldova and Russia, Application No 48787/99, ECtHR, Grand Chamber Judgment dated 8 July 2004, paragraph 392. Law of Ukraine ‘On Peculiarities of State Policy to Retain State Sovereignty of Ukraine in Temporarily Occupied Territories in Donetsk and Luhansk Regions’ No, 2268-VIII dated 18 January 2018, http://zakon.rada.gov.ua/laws/show/2268-19, article 1. Application of International Convention for the Suppression of the Financing of Terrorism and of International Convention on Elimination of All Forms of Racial Discrimination (Ukraine v Russian Federation), ICJ, Application instituting proceedings dated 16 January 2017, paragraph 39.
 International Criminal Court Office of the Prosecutor, ‘Report on Preliminary Examination Activities,’ 4 December 2017, paragraph 92. Resolution 2209 (2018) ‘State of emergency: proportionality issues concerning derogations under Article 15 of the European Convention on Human Rights’, Parliamentary Assembly of Council of Europe (PACE), 24 April 2018, https://bit.ly/2CF7YLD, paragraph 18.3. Appeals to United Nations, European Parliament, Parliamentary Assembly of Council of Europe, NATO Parliamentary Assembly, OSCE Parliamentary Assembly, GUAM Parliamentary Assembly, the national parliaments of the countries of the world on the recognition of the Russian Federation as an aggressor state, Resolution of Verkhovna Rada of Ukraine No. 129-VIII dated 27 January 2015, http://zakon.rada.gov.ua/laws/show/129-19#n9, paragraph 4. Press release ECHR 173 (2018) ‘Grand Chamber to examine four complaints by Ukraine against Russia over Crimea and Eastern Ukraine,’ Registrar of the Court, 9 May 2018, https://hudoc.echr.coe.int/app/conversion/pdf/?library=ECHR&id=003-6081540-7832894&filename=Relinquishment%20to%20Grand%20Chamber%20of%20four%20interstate%20cases%20Ukraine%20v.%20Russia.pdf, page 2. Reference: Latest from OSCE Special Monitoring Mission (SMM) to Ukraine based on information received as of 19:30 (Kyiv time), The Organization for Security and Co-operation in Europe, 3 August 2015, www.osce.org/ukraine-smm/175736. Reference: Images and Activity: Russian Military Bases on Ukraine’s Easters Border. Russia’s massive military presence bordering the non-government-controlled areas of eastern Ukraine, Atlantic Council’s Digital Forensic Research Lab, 27 October 2017, https://medium.com/dfrlab/images-and-activity-russian-military-bases-on-ukraines-eastern-border-724bb2527e58. Jarrod Hepburn, Ridhi Kabra, ‘INVESTIGATION: Further Russia investment treaty decisions uncovered, offering broader window into arbitrators’ approaches to Crimea controversy,’ 17 November 2017, IAReporter, www.iareporter.com/articles/full-jurisdictional-reasoning-comes-to-light-in-crimea-related-arbitration-everest-estate-v-russia/. Vienna Convention on the Law of Treaties, done on 23 May 1969, entered into force on 27 January 1980, https://treaties.un.org/doc/publication/unts/volume%201155/volume-1155-i-18232-english.pdf, article 29. Vienna Convention on Succession of States in respect of Treaties, done 22 August 1978, entered into force 6 November 1996, http://legal.un.org/ilc/texts/instruments/english/conventions/3_2_1978.pdf, article 15. Richard Happ, Sebastian Wuschka, ‘Horror Vacui: Or Why Investment Treaties Should Apply to Illegally Annexed Territories,’ Journal of International Arbitration, 33, No. 3 (2016): 245–268, Kluwer Law International, pages 258–264. Legal Consequences for States of the Continued Presence of South Africa in Namibia (South West Africa) notwithstanding Security Council Resolution 276 (1970), ICJ, Judgment dated 21 June 1971, paragraph 118. PJSC CB PrivatBank and Finance Company Finilon LLC v The Russian Federation, PCA Case No. 2015-21, https://pca-cpa.org/en/cases/130/. NJSC Naftogaz of Ukraine (Ukraine) and Others v The Russian Federation, PCA Case No. 2017-16, https://pca-cpa.org/en/cases/151/. (i) Stabil LLC, (ii) Rubenor LLC, (iii) Rustel LLC, (iv) Novel-Estate LLC, (v) PII Kirovograd-Nafta LLC, (vi) Crimea-Petrol LLC, (vii) Pirsan LLC, (viii) Trade-Trust LLC, (ix) Elefteria LLC, (x) VKF Satek LLC, (xi) Stemv Group LLC v The Russian Federation, PCA Case No. 2015-35, https://pca-cpa.org/en/cases/122/. Everest Estate LLC and Others v The Russian Federation, PCA Case No. 2015-36, https://pca-cpa.org/en/cases/133/. 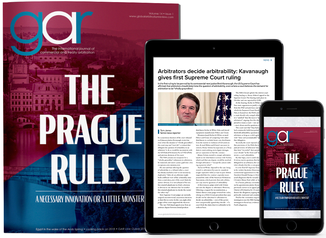 Jarrod Hepburn, ‘INVESTIGATION: Full jurisdictional reasoning comes to light in Crimea-related BIT arbitration vs. Russia’, 9 November 2017, IAReporter, https://www.iareporter.com/articles/full-jurisdictional-reasoning-comes-to-light-in-crimea-related-arbitration-everest-estate-v-russia/.